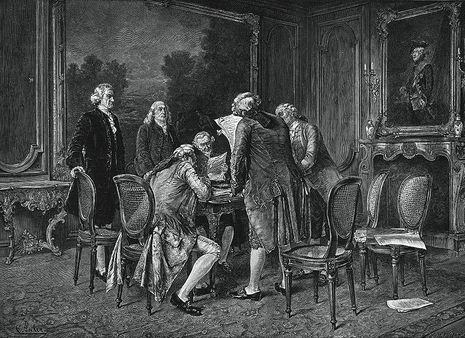 The Treaty of Paris, signed on September 3, 1783, ratified by the Congress of the Confederation on January 14, 1784 and by the King of Great Britain on April 9, 1784 (the ratification documents were exchanged in Paris on May 12, 1784), formally ended the American Revolutionary War between the Kingdom of Great Britain and the United States of America, which had rebelled against British rule starting in 1775. The other combatant nations, France, Spain and the Dutch Republic had separate agreements; for details of these, and the negotiations which produced all four treaties, see Peace of Paris (1783). The treaty document was signed at the Hôtel de York – which is now 56 Rue Jacob – by John Adams, Benjamin Franklin, and John Jay (representing the United States) and David Hartley (a member of British Parliament representing the British Monarch, King George III). Hartley was lodging at the hotel, which was therefore chosen in preference to the nearby British Embassy – 44 Rue Jacob – as "neutral" ground for the signing.